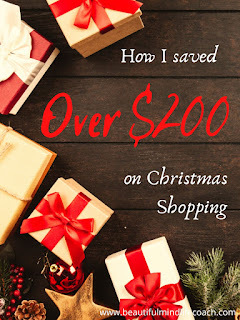 How I saved hundreds of dollars for Christmas. Christmas is an expensive time of year for most. For my family, we set a strict budget for Christmas and try not to go over. This year though is the first year I came out under budget! We set a $900 budget for all Christmas gift purchases. Since I don't work and my husband has had a kind of crappy sales year, we needed to have a strict budget to not overextend ourselves. For a few years, I've been using some money making apps to earn a little extra cash for Christmas and birthday gifts. This year it's really paid off! I was able to use $150 from these apps to put toward Christmas! Using rewards from stores has saved me a good chunk of cash as well! Want to know exactly how I saved so much money? Kohls: I love taking advantage of Kohl's because they have great deals, and they give you kohls cash for purchases you make. This year I did some shopping at Kohl's and ended up with $55 in Kohl's cash. So I was able to use that toward a few gifts for my extended family, and another gift for my hubby. Ebates: get $10 just for signing up! If you still have shopping to do, this will give you money back for purchases you make. I've already earned $20 and I signed up at the end of October! Sign up here. Ibotta: Use this wonderful app anytime you grocery shop. I've saved so much money on my groceries, and you can get gift cards to many stores including Amazon! Get $10 for just signing up!! I-say: If you are looking for a legitimate survey site to earn money, try out I-say! I've only used it for a short time but have earned a couple gift cards that I've used toward Christmas! Sign up today! If you hurry, you might be able to earn a little money to put toward your Christmas this year! Or start saving up for next year! You won't regret it! Incredible thoughts!! Regardless of how I plan for the occasions I generally appear to wind up spending more than arranged. Love the way how you are creative. I do love to save, that's for sure. I use a lot of these places that you mentioned. Ebates is a favorite! I've earned so much back from them. I definitely can relate for being on a budget this year for Christmas. I definitely have to look into these to make sure I can get some good deals and money for Christmas this season. I'm such a fan of ebates! I use it daily. There are a bunch of apps and extensions like that, that are so easy to use! I've never tried any of these apps, and people keep telling me they're awesome. I will definitely give them a try, thanks for sharing! I am not much of an app user; however, I can think of how some of these can be useful. I don't follow a strict budget for my December gift giving but I should. Yours ideas are wonderful as well as useful to save few dollars for this christmas! Thanks for letting us know your amazing ideas! Wow! This is what I need, saving money on coming Christmas! Thanks so much for the clever ideas! I always download the apps and forget to use them! I must remember for next year to help save some pennies. These are amazing ways to save money over Christmas. I also like they way you set aside a budget for shopping. Thanks for sharing. Wow, i never thought this before, amazing and simple ways to save money. thanks for sharing. This is great advice. I just downloaded Ibotta. hope it will save me some money as well. I'm also trying to stay within a budget. What a great way to wrap up the year with some great savings! Thanks for sharing these tips! We have what they call Flybuys here and its earning points that you turn into $$$ . I make hundreds of dollars a year on this and so do many others here in Australia. It can be a lifesaver for some! These are amazing tips to follow. It will definitely save you a lot. I think these are clever ways to not really tighten belts but to make sure you have enough for everyone.